Arniston Rangers: Rachowski, Donlevy, Moriarty, Opilka, Nisbet, Cunnison, Nicholson, Martin, Killin, Anderson and Morris. Subs, Trialist, Trialist, Cennerazzo, Borthwick, G/K Godfrey. Penicuik Athletic: Bald, Gallagher, Montgomery, Lynch, Meikle, Steel, Kelly, Barr, Cole, Walker and Moonie. Subs: Coleman, Korinek, McKean G/K Sandison. Penicuik who have over twelve hundred and fifty miles to travel in this season’s Premier League made the short trip to Gorebridge for a local derby against Arniston Rangers who are challenging at the top of the league. Arniston’s last two matches have fallen victim to the weather since their Scottish Junior Cup exit to Kello Rovers. The pitch survived a morning inspection and the game went ahead in far from ideal underfoot conditions. Players were caught in possession throughout the game and intended passes frequently fell short of their target as the ball was not running. Despite the conditions both teams served up an entertaining game which was evenly contested right up to the final whistle. Penicuik’s top scorer Johnny Harvey was missing through injury while Arniston’s top scorer Kyle Howitt was also an absentee. Penicuik were immediately on the defensive, conceding a free kick after fifteen seconds giving Nicholson the opportunity to swing a free kick into the heart of the Penicuik penalty area. From the clearance Grant Killin who played with Penicuik last season before switching to Arniston, cut the ball back from the right wing but Anderson blazed the ball high over the bar. Despite their two week lay off Arniston were looking sharp. Penicuik, however, replied when a long clearance found Cole who neatly set up Moonie but his strong left foot drive passed by the wrong side of the post. Arniston were content to knock the ball around at the back and retain possession. 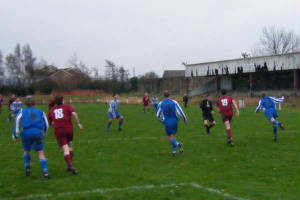 The decisive goal came in the twenty third minute when Anderson’s cut back from the right wing found DOUGIE CUNNISON on the edge of the penalty area. The Arniston midfielder came up with his first goal of the season with a quite magnificent strike which sailed over the despairing Bald and dipped just under the cross bar to nestle in the back of the net. It was almost two a minute later when the ball would not run for Barr in midfield and he was dispossessed. Killin broke free through the middle but he dragged his left foot shot past Bald’s left hand post and the score stayed the same. In the twenty ninth minute Penicuik looked set to equalise from a Gallagher corner but Barr’s point blank header was somehow scrambled clear from the goal line. Penicuik had conceded a few free kicks in the difficult underfoot conditions and the referee decide to take action after half an hour when he booked the unlucky Steel for his first foul in the match. Penicuik enjoyed a spell of pressure and Moriarty caught the eye with some timely clearances. 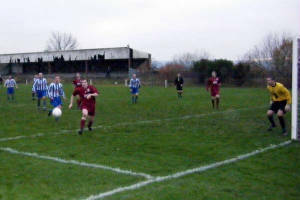 Montgomery and Moonie were prominent for Penicuik but the Penicuik attack lacked a cutting edge. Rachowski comfortably held a Gallagher corner before Penicuik passed up another opportunity six minutes before half time. Moonie was clean through but Rachowski was able to block his left foot shot and Walker hit the rebound wide of the right hand post. Two minutes later another Gallagher corner was cleared only as far as Steel but his cross failed to pick out a Penicuik head. On the stroke of half time Steel conceded a corner and when the kick came in Opilka thought he had notched Arniston’s second but Walker was able to block the header and clear from the far post. Both teams had served up an entertaining first forty five minutes and the pattern was to continue in the second half. A misplaced Moonie pass in midfield was seized upon by Martin but Meikle in the Penicuik defence was able to recover the situation and not for the first time, clear the danger. Gallagher up with his attack hit a right foot shot past the post before Moonie won a corner from a Montgomery pass. Moriarty again cleared up for the home team before Penicuik conceded another soft free kick in a dangerous position but Bald cleared the danger. In seventeen minutes Moriarty was cautioned by the referee for a wild lunge and was told by the referee that he was lucky that he was not giving him a second yellow card for throwing the ball away. From the free kick, Walker’s weak header was cleared by Opilka and the opportunity was gone. Arniston replied with a fruitless corner conceded by Steel before Walker was replaced by Coleman in Penicuik’s midfield with sixty five minutes gone. Kelly was limping after picking up an injury as Arniston chased a second decisive goal. Bald had to sprint off his line and dive on the ball and Opilka was booked for following in and kicking the ball after it was in Bald’s possession. Three minutes later Bald pulled off a terrific save from Nicholson before the Arniston man was the next player to be cautioned. Another Arniston attack came to nothing as Martin fired an attempt over the bar. The Arniston forwards were guilty of taking one touch too many as they tried to find an opening giving the Penicuik defenders the opportunity to block as the ball held up in the long grass. With fifteen minutes left Steel blocked Morris in midfield and his luck was out as the referee showed him a second yellow card and sent him from the park leaving his team with ten men. Despite the handicap Penicuik took the game to Arniston who now looked content to keep possession and play out time. Montgomery shot over the bar after good work by Cole before another Gallagher corner was cleared by the home defence. The Arniston rearguard was well marshalled by Nisbet and Moriarty as Penicuik kept up the pressure without ever really looking like making the breakthrough. Arniston almost added to their lead in a swift break but Martin shot past the post. In the eighty seventh minute, Moonie was unable to take advantage of a flick from substitute Korinek making his Penicuik debut before a Gallagher corner in the ninetieth minute was again cleared. Deep into additional time Rachowski fumbled a Moriarty back header but Moonie did not react quickly enough to take advantage. With almost five minutes of additional time played Arniston made their final substitution to further run down the clock. 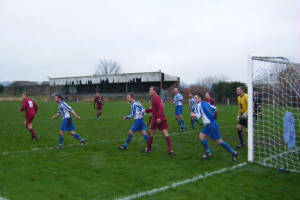 Penicuik won another corner kick but the final whistle went before the kick could be taken meaning that Arniston picked up all three Premier league points in this evenly contested local derby. will need to improve on that haul in the second half of the campaign to stay away from the three relegation slots.